Cannot be Normal Summoned/Set. Must be Special Summoned (from your hand or Graveyard) by sending 4 face-up Level 1 monsters you control to the Graveyard, and cannot be Special Summoned by other ways. Other monsters you control cannot attack. During either player’s Battle Step, once per battle involving this card: You can banish 1 Level 1 monster from your Graveyard; until the end of the Damage Step, this card is unaffected by other cards’ effects, also it cannot be destroyed by battle. Dystopia the Despondent is a huge monster for the little monsters of Yu-Gi-Oh. Level 1 monsters aren’t always the greatest, but you’ll need 4 of them face-up to Special Summon this card. It can’t be Special Summoned any other ways, a downside, but can be Special Summoned from hand or grave, giving it some flex to being sent to the grave via another effect for easier access (Foolish Burial. The monsters need to be sent to the grave, so no Token shenanigans. Can’t attack with anything else, but with 5000ATK you won’t need to. Complete protection during each Battle Step via banishing a Level 1 from the grave (you’ll have at least 4 presumably). Fantastic protection is a reward for a card that is tough to bring out. Despondent can’t be dropped into a deck, it has to be the cornerstone of the deck. There’s plenty of ways to spam the board with Level 1 monsters, but they are their own niche. So it would seem we are reviewing Dystopia the Despondent in a world where boss monsters only need protection during the Battle Phase. Um, No. Level 12 Dark Fiends with 5000 Atk and 5000 Def need protection because of the amount of effort in summoning them. This one requires 4 face-up Level 1 monsters to be sent to the grave to Special Summon Dystopia from the hand or grave. At least it can come back, but it cannot be Special Summoned by other ways. Other monsters cannot attack which also a huge bummer. The protection effect requires banishing a single Level 1 monster from the grave, but it only lasts the one battle during either player’s turn. If they have more monsters than you have fodder, Dystopia is going down. Obviously, any removal whatsoever will also take it down. This card will only be worth it if its stats and effect are copied by something else. Not worth the investment to own the card or summon it, even casually. Jump Promos can be interesting and today we will look at a Jump Promo, Dystopia the Despondent. Dystopia is a Level 12 DARK Fiend with 5000 ATK and DEF. Stats are very strong, you’ll need some boosts to kill it. Fiend is a good type and DARK is a great attribute. Dystopia cannot be Normal Summoned or Set and must be Special Summoned from the hand or GY by sending 4 Level 1 Monsters you control to the GY. So naturally it is a minus 3 to get this thing out, sometimes a minus 4 if it is coming from the hand. Not only that, but Level 1 monsters aren’t the easiest to keep alive. While you control Dystopia, other monsters you control cannot attack. If you are playing this, you are likely playing a Level 1 spam deck, and you rarely attack with Level 1 monsters. During either player’s Battle Step, once during battle, you can banish a Level 1 monster from the GY and until the end of the Damage Step, this card is unaffected by other card effects and cannot be destroyed by battle. This is protection it should of naturally had, considering you are giving up 4 Level 1 Monsters for this thing. Only getting protection of any sort during battle and having to banish a Level 1 is unnecessary. 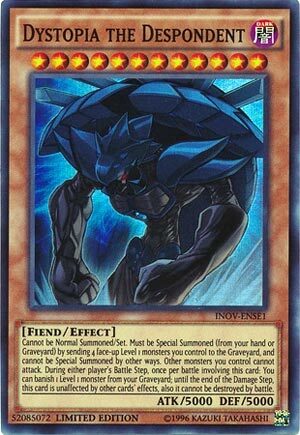 This thing is highly immune to removal, which your opponent will likely use for a 5000 ATK and DEF wall. Dystopia isn’t that great. Building a deck around him might be fun, but don’t expect players to splash him into any deck that might run a high amount of Level 1s, which only Level 1 Spam really does. Art: 3.5/5 Erebus got a little buff it seems. Today, we look at a Jump promo, that also found it’s way into the Invasion: Vengeance Special Edition boxes, Dystopia the Despondent. This is a Level 12, Dark attributed Fiend, with a herculean 5000 attack and defense. (That alone made me want to look at this card). So to start, he can’t be Normal Summoned or Set, and can only be Special Summoned by sending 4 face-up Level 1 Monsters you control to the Graveyard. Wow…his Summoning requirement is almost as herculean as the attack and defense. He can’t be Special Summoned in other ways. What Decks could pull this off? Skull Servant maybe, you’re all ready playing Level 1 Monsters in there…Kuriboh can help with this. Magician of Faith would too. The fact the Monsters you use have to be face-up hurts too, so you’re probably looking at a Stall Deck. The Exodia limbs are Level 1, and you could use the four of those, and cycle them back to your Hand after from the Graveyard, but that sort of contradicts playing Exodia. Dystopia also prevents other Monsters you control from attacking. That’s bad, but I suppose fits something named Dystopia. But you can still have other Monsters out to protect this one. He does, however, protect himself. Once per battle, during either player’s Battle Step, you can remove a Level 1 Monster from your Graveyard from play to protect this card from other effects and prevent it from being destroyed in Battle. The protection is massive, one because of all you have to invest in this card just to get it out, and two, because once it leaves the Field, it isn’t coming back. He absolutely needs his own Deck to function properly, but I feel he could win you some games. Art: 4/5 I’m not entirely sure what’s going on, his body sort of looks like a dark Obelisk, but he has spikes and a giant shell it seems?